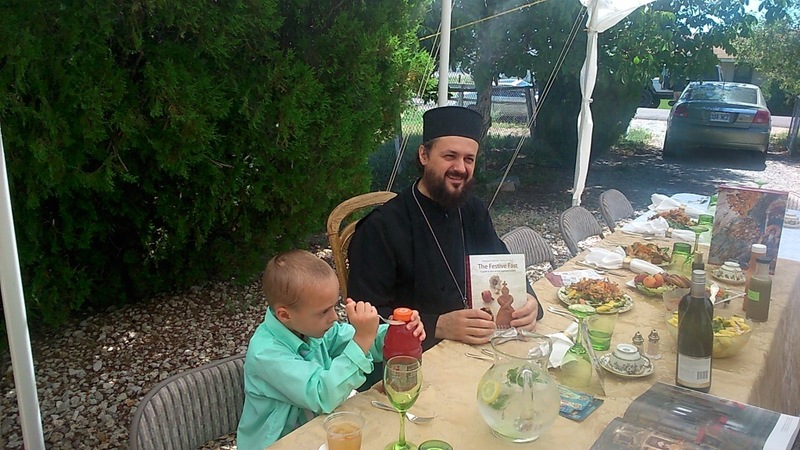 Reno, NV - His Grace Bishop Maxim made his Archpastoral visit to the Saint John the Baptist Serbian Orthodox Church in Reno Nevada on July 5, 2015. The occasion was to gather the faithful for the Church Slava, the annual Eucharistic Celebration of the Saint of this temple commemorating the Nativity of the Holy Forerunner Saint John the Baptist. Greeting his grace was the Parish Priest Protopresbyter Fr. 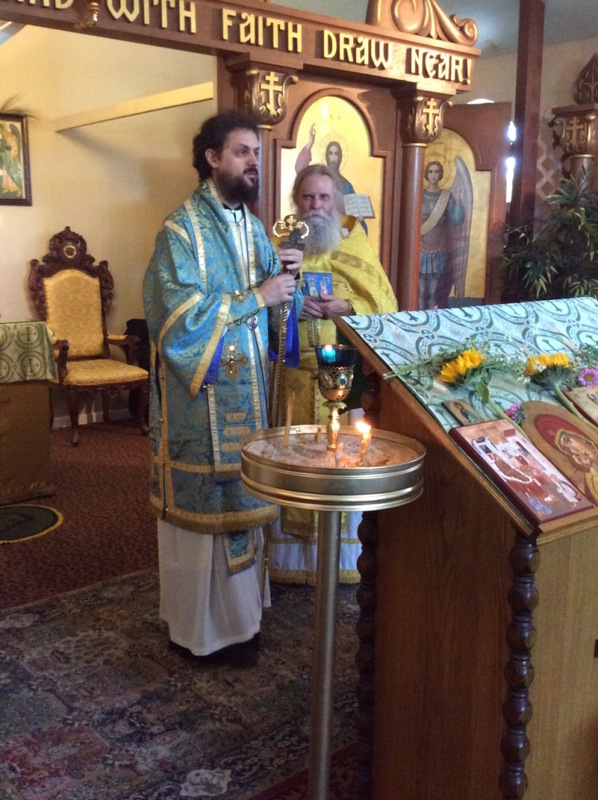 James Barfield and accompanying his grace was Deacon Dragan Stojanovich from the Saint Sava Serbian Orthodox Church in Jackson California. Among the many joyous moments of the feast day was the elevation of Father James to the rank of Protopresbyter. Bishop Maxim congratulated Fr. James with appreciative encouragement as he noted the service of Fr. James in the Reno area of the Western American Diocese. Bishop Maxim gave his homily on the Gospel Reading reminding us of the deeper meaning of the Gospel lesson in that we see how all creation suffers as a result of man's original fall into sin. His Grace mentioned that this fall of man affects all of creation as an extension of mankind including our ecological surroundings. 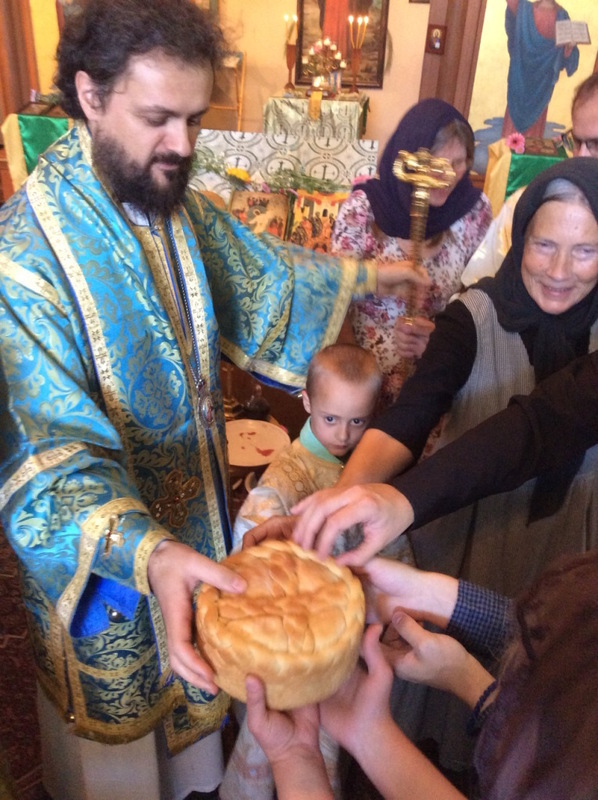 The service of the Patronal Feast "Slava" was offered in the Church with all of the faithful and guests, in unity, turning the patron Saint's cake "Slavski Kolach" while singing the hymn "O Holy Martyrs". The Bishop had a surprise for the children giving them various candy treats. The faithful then convened for the meal prepared by the parishioners, and all enjoyed the festive setting and the sunny Nevada weather. Bishop Maxim took the opportunity to talk about the newly proclaimed Saints Mardarije of Libertyville and Saint Sebastian of Jackson. These Saints who did their missionary work in America will be glorified later this year in Los Angeles CA. Our Vladika also displayed the great monograph "The Christian Heritage of Kosovo and Metohija" as well as other books produced by Sebastian Press. Some of the books were taken to be available at the Forerunner Bookstore in Reno which was originally founded in 1991 by this missionary parish of Saint John the Baptist. After Vladika wished all a blessed day of resurrection upon his departure, Father James then took Bishop Maxim to visit Nektary, a parishioner who is currently in the hospital. Nektary is active in local prison ministry witnessing Orthodox Christianity to the prisoners, and we pray that he may recover soon. 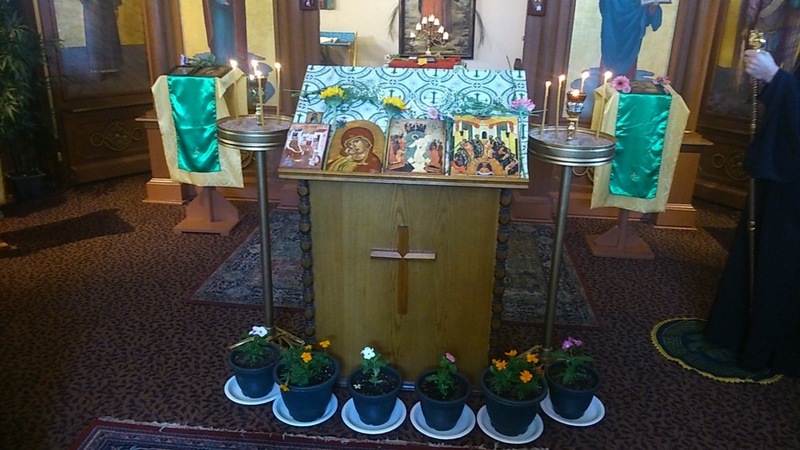 May The Lord continue to bless the Parish of Saint John the Baptist in Reno, Nevada.